mcSquares, Easy Float, and Still Company are three of the businesses participating in Trout Tank Spring 2016. Read more about the companies themselves, and why they were started here. Union Stitch & Design, My Kids Lunch, and Colorado Caliber are three of the businesses participating in Trout Tank Spring 2016. Read more about the companies themselves, and why they were started here. DirtTRI, Flipside Pillow and Luv Byrd are three of the businesses participating in Trout Tank Spring 2016. Read more about the companies themselves, and why they were started here. When considering starting her own business, Jessica Burke was given the advice, “do something you completely love, even in the tiny details.” The only thing she felt absolutely certain she loved – tiny details and all – was paper products. "I was inspired to start My Identity Doctor™ not to become rich, but because I believe if you truly care about customers, the quality of your product and believe in yourself, the money will come naturally in conjunction with the right business plan. No other company that employs me can pay me enough for the self-gratification of putting in a hard days’ work and at the end of the day say it is mine and to make it a success." Blue Grimes, founder and president of Out of the Blue Screen Printing, loves hearing new ideas for how to improve his business. And he has received them from business students for over five years through the Denver Metro Small Business Development Center’s (SBDC) Strategic Business Analysis. Grimes is in the process of executing new marketing strategies in social media and on the company’s website that he hopes will ultimately boost sales and drive new business. Many of the changes he is preparing to implement are in response to the feedback he received from the students at Metropolitan State University of Denver (MSU Denver), which provides the student-driven manpower of the SBDC’s Strategic Business Analysis. *Click here to read the full article. Spinelli’s Sauce Co., known for its pasta sauce, recently expanded into salad dressings. Photos by Burl Rolett. A local spaghetti sauce maker is pushing into the supermarket refrigerator section. Spinelli’s Sauce Co., which sells pasta sauces in about 300 western grocery stores, is working a deal to put a line of salad dressings in 145 Rocky Mountain King Soopers and City Markets. It’s a big step up from the 15 or so specialty grocery stores where Spinelli’s dressings are currently for sale. Chris Rogers makes a pitch to potential investors. Rogers said she hopes to have the dressings in King Soopers fridges by the end of the summer, about eight years after her sauce company first launched out of Spinelli’s Market in Park Hill. 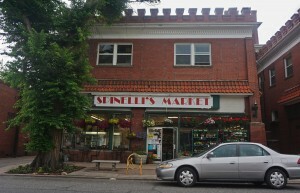 Rogers worked as a chef at Spinelli’s Market when it began bottling pasta sauces in 2007. She is now the majority owner of Spinelli’s Sauce Co., but does not own the market itself. Spinelli’s began bottling three salad dressings a year ago, Rogers said. Since then, she’s put the brand’s Caesar, gorgonzola and balsamic flavors in 11 Whole Foods and two Marcyzk’s Fine Foods locations. As Spinelli’s ramps up its dressing business to about 160 total stores, Rogers is looking for outside investment to help fuel the company’s growth. 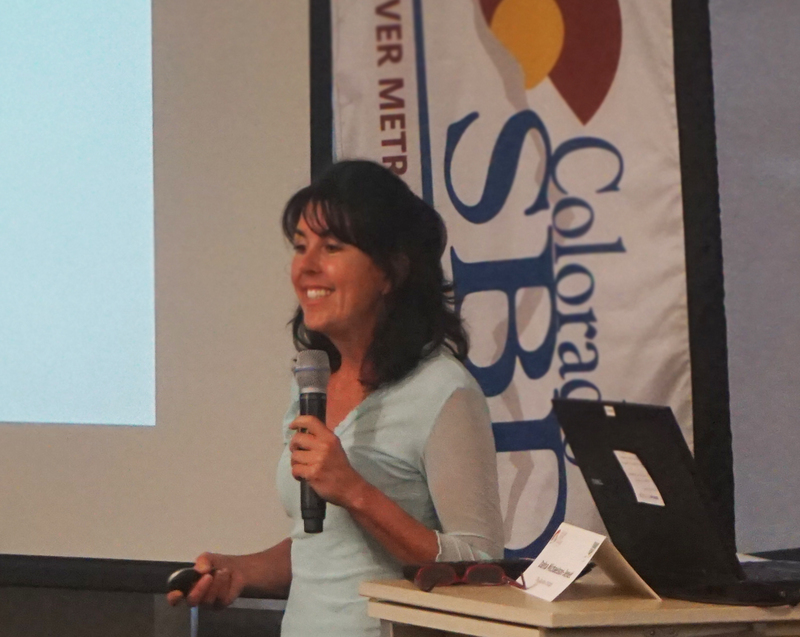 She recently pitched to 30 potential investors at a Denver Metro Small Business Development Center event, Trout Tank, looking for $150,000 in exchange for a stake in the company. 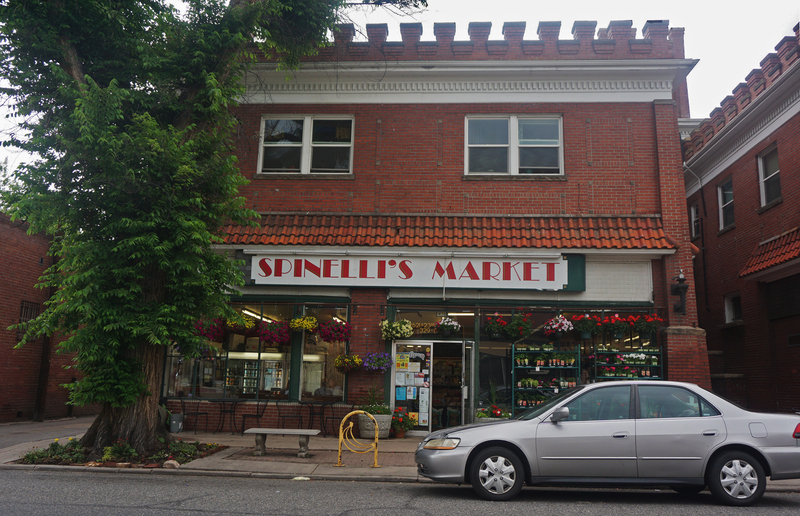 The sauce company got started at Spinelli’s Market at 4621 E. 23rd Ave.
It’s cash she plans to use for in-store demonstrations, product development and working capital. 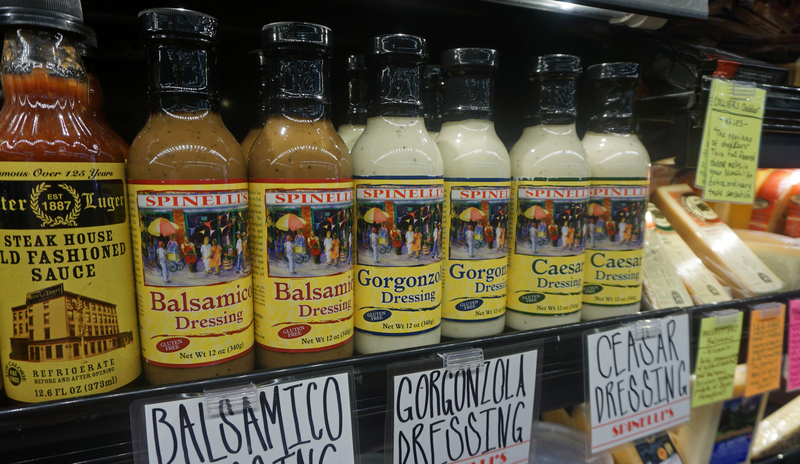 Spinelli’s Sauce Co. currently makes the dressings itself at a commercial kitchen. A Littleton-based co-packer makes the pasta sauce, and Rogers said she’ll need to find a similar outfit to churn out enough dressings to stock 145 King Soopers stores. Stocking stores with dressings is tougher than keeping pasta sauce on the shelves, Rogers said. Spinelli’s is still handling deliveries to stores itself. And because the dressings have to stay refrigerated, Rogers can’t expand to stores too far from the Denver area. With the King Soopers deal, Spinelli’s will drop off its dressings at a distribution center, and the grocer will take them from there. 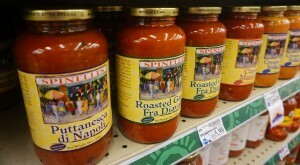 King Soopers currently sells Spinelli’s sauce for about $6 or $7. Rogers estimated Spinelli’s would sell about 132,000 bottles of sauces and dressings in 2015. The company did about $335,000 in total revenue last year, Rogers said at last week’s SBDC pitch. The company makes about 20 percent profit margins on dressings, she said, compared to about 15 percent on pasta sauces. Right now the pasta sauce line includes Spinelli’s Classic Marinara, Creamy Tomato Vodka, Roasted Garlic Fra Diavolo and Puttanesca di Napoli sauces. Spinelli’s sauces are in more than 300 stores stretching from Wyoming to Texas and Kansas to Nevada. In the coming years, Rogers said she hopes to double sales at the stores she stocks currently, open in new regions and begin selling the sauces and dressings to restaurants. A chef by trade, Rogers is also working on getting new recipes to market. Burl Rolett is a BusinessDen reporter who covers commercial real estate and the business of sports. He is a graduate of Washington and Lee University. Email him at burl@BusinessDen.com. Generation Entrepreneur: Does Your Birthday Impact Your Business? What drives entrepreneurs? More importantly, does that drive change if you’re a Baby Boomer, a Gen Xer or a Millennial? As the SBDC and Denver Metro Chamber of Commerce gear up for State of Small Business: Generation Entrepreneur on Feb. 18, we begin to consider what dr ives entrepreneurs across different generations. With the help of Millennial and Love Grown Foods founder Maddy D’Amato, Gen Xer, CTO and NIMBL co-founder Michael Pytel and Boomer and Dazbog Coffee President and COO Leo Yuffa, we’re bound to hear about generational differences and find some common ground in how each entrepreneur approaches launching and running a business. Before we hear their stories at State of Small Business, here’s a primer on each generation and how they work. for social startups like Facebook. Millennial entrepreneurs describe themselves as creative, confident and positive. Why they stand out: Being tech savvy and coming of age in a global economy makes them highly mobile and interested in flexible work hours. They also value working for fulfillment and purpose over pay. economic growth within the next year, but they are worried about how economic issues will impact their business. been saving up for the opportunity to break away from corporate America to start their own businesses. Why they stand out: This group views themselves as hardworking, dedicated, independent and creative. That independence, coupled by distrust in big business after two recessions, motivates their entrepreneurialism. They have solid work experience and have taken time to learn a trade or industry. Most think through their business plan prior to executing and use their own capital from savings. How they’ll change our economy: Thirty-four percent of Gen Xers are interested in starting and running a small business, according to Independent Community Bankers of America. They’re also most likely to target new industries and customers in the next year. Baby Boomers: The Face of Small Business? Who they are: Born between 1946 and 1964, this dedicated and hardworking generation values and rewards loyalty. Why they stand out: Boomers make up the largest percentage of business owners in the U.S.—nearly 51 percent. With the “longevity bonus,” they’re living longer, more active lives and they are interested in continuing to work. They also are able to leverage their expertise, broad networks and savings to start a business. How they’ll change our economy: The share of business owners in this generation has been increasing over the last few years. Today people over 55 are almost twice as likely to create successful start-ups as those ages 20 to 34. However, fewer existing business owners in this generation have plans for growth. Optimistic Millennials, independent Gen-Xers and hard-working Baby Boomers may operate and think differently, but these entrepreneurs are all working toward a common goal: creating jobs and wealth. Hear more about how each generation is shaping entrepreneurialism at State of Small Business on Feb. 18. Alea Kilgore is the manager for the Denver Metro Small Business Development Center.